Paul and I are foster parents for Hopeful Hearts in Ottawa, Canada. 10-year-old Yoda was removed from a “neglect” situation in Bowling Green, Kentucky. During the four months we fostered her, she developed trust and confidence. Yoda now struts down ‘her’ street, initiates play and asks for belly rubs. We’ve fallen in love with this sweet old girl and recently adopted her. Our friends and family made it official on our wedding day by paying the adoption fee. Yoda came along to our wedding photo shoot in the woods and ensured we remembered that she’s the centre of our lives. Posted September 3rd, 2013 . She is a very adorable photobomber. Congrats on the wedding, and a cute furry friend. Thanks so much, Leslin. Our favourite wedding pictures and definitely the ones she’s in. Love the peeking around the leg. Congrats to all. Great pictures – what a beautiful girl. Love all around! What a great family. Think this is my favorite photo bomb ever! Gorgeous pup who deserves to be the center of attention. Thanks so much! We love our sweet old Yoda. Every dog deserves a second chance. She’s nearly 11, but lots of love and play left in her. You’re all going to have wonderful life with your loving, giving hearts. Yoda is the cutest photobomber ever! Very touching story! Dogs make the best photo bombs! They DO! Yoda was absolutely the star of our wedding. Love our old girl and we can’t imagine our lives without her. What better wedding pictures than ones including the whole new family! Gotta love those cattle dogs! 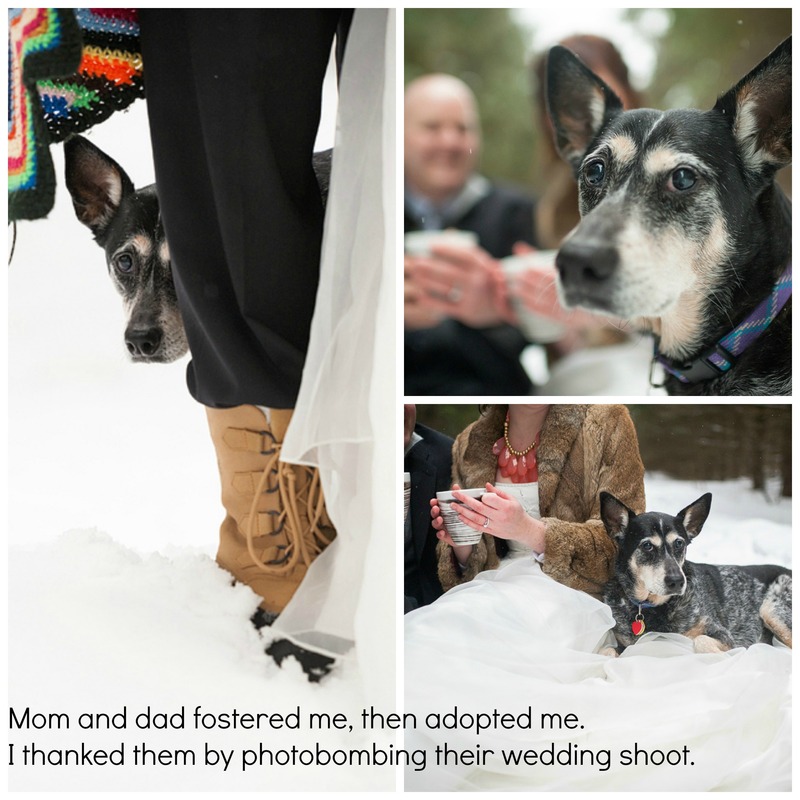 My wedding pictures also have a red heeler in there — but intentionally, not as a bomb! Congratulations on the marriage and a wise decision to take Yoda on! Hopeful Hearts in Ottawa has an ongoing relationship with the Bowling Green SPCA… and we’re so glad they do. Yoda is the second old pooch we fostered (and adopted) who came via Bowling Green. that’s awesome! i’ve a friend who adopted her fabulous, now16 yo terrier mix from hopeful hearts 5ish years ago!! Sweet girl who knows she’s loved…. congratulations to Mom, Dad and Yoda! Now, this made me tear up with happiness. Congrats x 2 and love all around. Thanks for saving Yoda, you have a beautiful heart. Such a sweet story….and a beautiful dog! What a sweet old girl…….you are very lucky to have found her! Great pics! Great story! Congrats! And your new husband for welcoming two seniors. The greatest gift you could have given them is to share your big hearts. There isn’t anything like giving and receiving the gift of love. Best photobomb ever! I love it! I am so happy to have photographed Heather and Paul and of course, Yoda, on their wedding day! She was very proud to be a part of such a wonderful celebration! What a lovely photo/story. Sitting here crying like a baby. Much happiness to you all. Awwww. Thanks Gabrielle, She’s a wonderful old girl and we love her dearly. I help to drive dogs for Hopeful Hearts. Very, very nice to see one of our travel companions make it to the big time……a real forever home! Whoops… that was meant to be a smiley face! yoda seems glad for the rescue, cant say the same for that fur coat though.